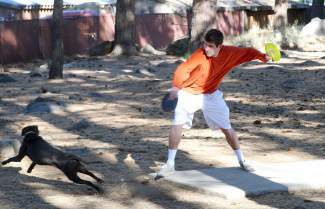 Scott Fahrendorf, right, makes a forehanded throw with a disc â his driver â as his dog Martin makes chase on Monday at Truckee River Regional Park. Fahrendorf, a Truckee resident, has been playing disc golf for 10 years and has seen the popularity of the sport grow rapidly over that span. 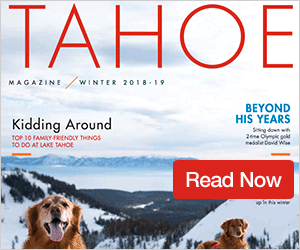 Where: South Lake Tahoe, Calif.
TRUCKEE, Calif. — Inhaling a sharp whistle, Scott Fahrendorf raises his Frisbee for his dog Martin to stare and unspool his tongue at for a split second. Then Fahrendorf quickly crouches, pivots his back foot and flings the neon yellow disc — hard. The toss is not meant for Martin to chase down and catch in his mouth. No, the toss is zipped tightly at a metal basket circled with chains — a disc golf target — at the Truckee River Regional Park Disc Golf Course. For Fahrendorf, a Truckee resident, there’s nowhere he’d rather be on a lazy, sunny Monday afternoon. 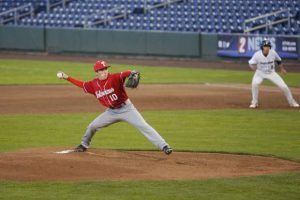 “It’s the best way to get my dog some exercise, and it’s also just great to play the sport,” Fahrendorf said. Fahrendorf is far from alone. Visit any of the area disc golf courses — there are a handful — and one will hear the frequent clangs of discs spinning into baskets from sunup to sundown. 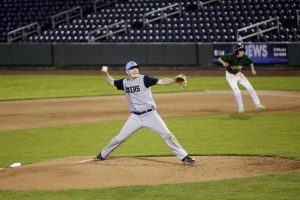 Indeed, the sport has rapidly grown in popularity in the last decade. According to a 2013 study by the U.S. Disc Golf Championship, the number of disc golf courses listed with the Professional Disc Golf Association has increased by 48 percent since 2008. 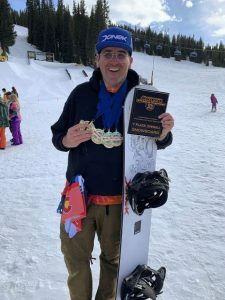 David Polivy, owner of Tahoe Mountain Sports and director of many of the region’s disc golf tournaments, thinks the numbers are only going to keep climbing. Much of that heightened interest and expansion has occurred in the Lake Tahoe area. In fact, with nine regional courses at an altitude above 6,000 feet and varying in difficulty and terrain (hilly, flat, foresty), Tahoe is known as a disc golf destination not only in the West, but the entire the United States. Aside from the array of scenic courses, why else does disc golf’s popularity continue to soar in Tahoe-Truckee? “It’s a good way to get out and it’s cheap and fast — a lot faster than ball golf,” said Toby Johnson, a Kings Beach resident. Johnson was playing with his longtime friend Jeff Fillinger, a Truckee native, at Truckee River Regional Park. Aside from the length of time needed to play 18 holes, disc golf shares more similarities with ball golf than many might realize. Sure, you can get by with just one disc and a desire to hike through the woods. But, if you want to hang with the Fahrendorfs, Fillingers and Johnsons — all three play competitively in area tournaments — one needs more than a single disc and hiking shoes. “You’re going to need a minimum of three discs: a driver, mid-range and a putter,” said Polivy, whose shop, Tahoe Mountain Sports, has all the disc golf equipment required. “Just like in regular golf, you have different clubs that do different things, go different distances, the same thing is true for disc golf. Not to mention, there are a variety of ways to hold and throw the disc. Based on the sheer number of people who visit a disc golf course like Truckee Regional Park on a cool October day, it’s safe to say that’s exactly what people are doing. Navigating disc golf courses like clockwork, by themselves, with their dogs, or with friends.